It's always a treat to be able to work with my husband, Jose Luis Malagon, on an engagement shoot. Sabine and Tim were so fun and playful and we felt so lucky to have been able to capture such a special moment in their lives. Daniels Park and its rocky foothills, lush green and scenic mountain view were perfect for an afternoon of love. 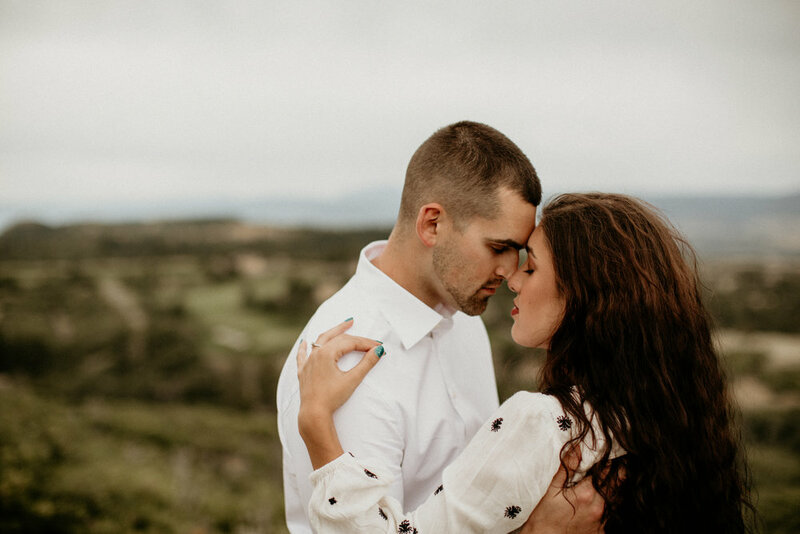 This engagement was very special to Sabine and Tim, because they were spending their last days in Denver with friends and family, before heading off to their new adventure together to Connecticut. This was my first time meeting Tim and I could already tell they were two peas in a pod. Tim is in the Navy and no words can express our gratitude for all the men and women serving our country and their families that support them everyday. The weather forecast predicted some scattered thunderstorms and Sabine and Tim embraced every moment. We all were amazed by the beauty of nature, especially when these dramatic storm clouds rolled in over the rocky cliffs. Luckily we weren't too far from more stable grounds and the storm decided to settle down a bit.